Over the years, I have been accused of being male for many reasons. One that amuses me the most is because Sugar, the character's avatar has large breasts. Men make large breasts and women small ones, I was informed. Therefore, I am male. No. Sugar has large breasts, yes. But, Sugar's breasts are not the maximum breast size in the character creator. Men often pick the largest breasts they can. I can pick guys because they have a stick thin avatar with an enormous chest. Sugar's fit her body. 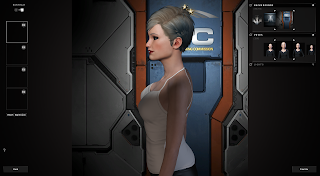 I took the time to play with the character creator and move my avatar up from stick with a horrific haircut to balanced looking, attractive woman. But the posture. I noticed a new background on someones icon. Well... new to me. It was rather bright which caught my eye after years of dark backgrounds, with dark lighting, or just people angling their avatar to have the biggest breasts possible. That is if they put any energy into it at all. This made me look at the character creator again. It looks as if poses have changed some. You can see more of the avatar. I also learned Walking in Stations was put down. Oh well. That is how I entered into the exploration of new backgrounds and discovered that my avatar has terrible posture. The poses have always been weirdly awkward. Who shoves their shoulder above their jawbone that way? But now, with more of the avatar viable, the horrid posture was startling. Maybe I'm not supposed to look at these things. Ack! - delete leaves a trail. Here's the slightly edited (and properly readable) version that led me to delete in the first place. I remember spending a great deal of time trying to get Dire’s portrait looking the way I wanted included bob haircut. Sadly, her portrait bob cut isn’t really a bob cut, it’s a punk do but you couldn’t tell unless you clicked to full body view. This made me sad until CCP introduced the Red/Black ‘Eternity’ apparel line which meshes gloriously with the punk do. Now she looks fantastic from every angle. I’ve spent a lot of time with Dire since 2009. I’m glad we expended the effort getting her appearance in proper order. By that logic I must be female. Both my Cyno Girls are small breasted to match their Asiatic appearance. With CQ gone it is all a bit pointless really.